Sometimes it seems to me that kitchen sink is one of the dirtiest and germiest places in the kitchen. So today, I’m going to share with you several tips that will help you to combat bacteria, germs and dirt on your kitchen sink. Before cleaning your sink, empty it. Take away everything that may be store in it. Take usual baking soda and sprinkle it all over your kitchen sink. 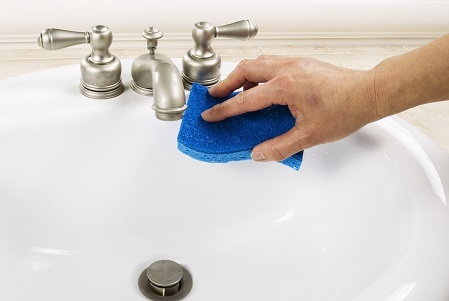 Use a scrubbing brush or a usual cloth to scrub your sink with a baking soda paste. Clean everything, including faucets and edges of the sink. Rinse the sink with running water. The next step is to soak paper towels in vinegar and to cover the sink with them (don’t forget about the faucets). Leave the paper towels in a sink for about 20 minutes, and then throw them away. Then use usual dish soap and a cloth – thoroughly clean your sink and rinse it well. Our cleaners recommend washing your garbage disposal together with your sink, because while cleaning your garbage disposal, you use the same cleaning supplies. 1. Harsh and abrasive cleaners may ruin stainless steel, fiberglass, marble or acrylic sink. 2. A stainless steel sink should be kept dry when nor used. 3. Do not clean your kitchen sink with bleach or ammonia. 4. Stone sinks shouldn’t be cleaned with acidic or chemical products that can ruin your sink. 5. Warm water and dish soap are considered the best and neutral cleaning products for everyday cleaning. For more thorough cleaning, just follow the steps mentioned above. The best way to keep your sink clean is to clean it every day!